The fast-moving creek along the Lost Creek Trail near Hessie, Colo. The road passing through “downtown” Eldora outside of Nederland, Colorado turned to dirt, then forked near the old Hessie town site. Although long abandoned as a mining camp, Hessie attracted quite a crowd on this spectacular Saturday in mid-October, and for good reason. 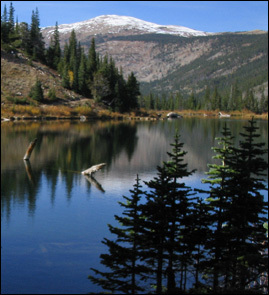 This area, just east of the Continental Divide in Roosevelt National Forest, borders the Indian Peaks Wilderness and is laced with hiking trails, many of them leading to alpine lakes. Ironically, the easiest lake to find here is Lost Lake, our destination. Approximately 5 miles out and back from the parking area, this easy hike featured a swift, cascading creek; cool, lush forest passages; views of the Continental Divide; and, of course, an alpine lake. While solitude was not found on this trek, the spectacular scenery more than compensated. From the fork in the road out of Eldora, where a suitable parking area was tightly packed with vehicles, the main Hessie trailhead was about one-half mile to the west. The beginning of the hike fell within the shadow of the Eldora ski area with a few ski runs visible high up on the hill to the left and south. A little snow from a storm the prior week still remained in the deep autumn shadows along the trail. Although it was a few weeks past the prime time for aspen trees to display their golden leaves, a few brightly hued aspens remained sprinkled across the landscape. Lost Lake with a snowy Continental Divide in the distance. The trail officially begins at the Hessie town site (at 9,000 feet elevation) about a half-mile from the parking area. Most of the land in this immediate area, a sign informed, is privately owned. Just beyond the site, a trail sign noted that it is 1 mile to the Lost Lake Trail. Several trails go deeper into the forest. The trail moved uphill at a fairly easy grade along an exposed, rocky dirt road, winding up through a grove of small aspens. Between groups of hikers passing down the trail, one could hear the peaceful rustling of the few remaining aspen leaves as a light wind blew from the south. 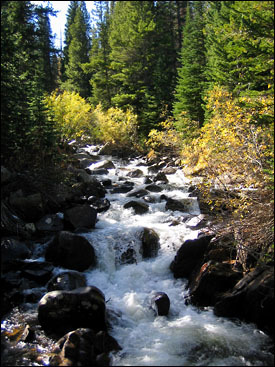 Looking back at a crest of the grade, the forested valley of MIddle Boulder Creek extended to the east toward Nederland. Leveling off, the trail passed through a lush aspen and spruce forest and joined up with a noisy creek, presumably replenished with some early snowmelt from above. Following the recent snowfall, this part of Colorado enjoyed several consecutive cloudless days and bright sunshine, quickly melted much of the snow that fell in the high country. The trail soon forked at a stream crossing, with the route to Lost Lake to the left. The creek here was raging, cascading down a steep rocky chute. About 70 yards upstream past the crossing, a cascading falls appeared on the right, loud and crashing, spraying fine mists of water from the rocky streambed. Along the trail circling Lost Lake. Moving up into the forest, more snow appeared on the ground as this section was completely in the shadows of large rocks and dense spruce. Another sign soon appeared, pointing to King Lake Trail, Woodland Lake Trail and Devil’s Thumb Trail to the right, and Lost Lake to the left. The final stretch of the hike to Lost Lake was an uphill, rocky path sheltered by large spruce trees. 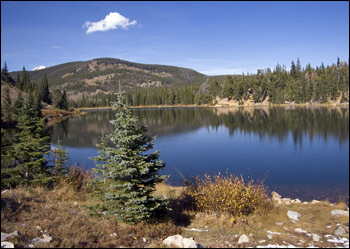 Through openings in the forest canopy, the high peaks of the Continental Divide could be seen. Lost Lake was extremely placid this day, brilliantly reflecting sky, forest and mountain. The still surface was occasionally breached by trout at the far end of the lake. A trail circled the lake, with several designated campsites on the west side. A few underground brooks crossed the trail, feeding into the lake. Lingering at this alpine oasis, one is hesitant to leave, hoping to capture the essence of high-altitude Colorado splendor before the inevitable return to the city.